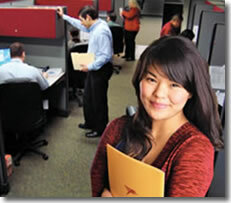 Pronto has years of experience in running a large number of highly successful insurance agencies. We have developed competitive products and an extremely effective business model that consistently outperforms the competition. As a Pronto franchise you not only receive the great advantages of brand recognition, you receive extensive training and expert support in site location, operations, marketing and human resources. As a Pronto franchise you will own a full service insurance agency that will include complete support in every aspect of the business at a very affordable price. This low cost franchise opportunity is one of a kind and it is unforeseen in the market. You do not have to invest in high cost equipment, large inventories or a large staff like the majority of franchise opportunities. You simply need to equip an office in a retail location, hire a few employees and you are on your way to running your own Pronto Franchise. This portion of the training will teach you in great detail, the everyday operation of your own business. The "Hands On" portion of the training involves you participating in the everyday activities at an actual Pronto agency. selling to your new customers. Pronto Franchising offers two types of franchise plans. The site selection process is extremely important to the success of your business. Single Unit ~ There are many opportunities in all markets throughout the state of Texas. The awarding of a franchise to a specific location is dependent on a demographic study that is applied to a proven formula that incorporates a large number of factors like specific demographics, traffic counts, physical attributes and competition. Area Development Plan ~ This opportunity is awarded to a company or individual that will develop a given territory by opening a specific number of franchises under a scheduled amount of time. These opportunities exist in larger markets throughout Texas. We appreciate you taking a closer look at the Pronto Franchise concept and hope that we can provide you with the necessary information so that you can make an informed decision that matches your needs and goals. Please note this franchise is accepting inquiries from Texas ONLY. 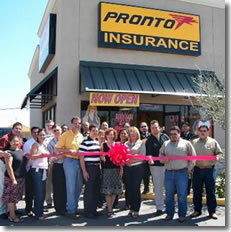 Click on Request Information for FREE info on how to open a Pronto Insurance franchise today! Please Note: This Pronto Insurance franchise opportunity and other franchise business opportunities, businesses and franchises for sale on this web site are not to be considered as an "offering", "franchise offering", suggestion or recommendation by Franchise Leader™. This advertisement depends entirely on the truthfulness of the information provided by our advertisers which includes, but is not limited to, franchisers, franchise brokers, franchise consultants and business brokers. Franchise Leader™ recommends that you consult a lawyer, financial consultant, accountant or professional advisor before buying a franchise or business opportunity or any type of business. By using this form or any part of our website, you have agreed to all terms and conditions of Franchise Leader™. Please review our Terms & Conditions for more information.